When you externalize resources, you keep them separate from your app code. For example, instead of hard-coding a string into your code, you name the string and add it to the strings.xml file, which appears in Android Studio&apos;s Project > Android pane inside the values folder in the res folder. Store all your resources in the res folder. Organize resources by type into folders within res. You must use standardized names for these folders. For example, the screenshot below shows the file hierarchy for a small project, as seen in the Project > Android pane. The folders that contain this project&apos;s default resources use standardized names: drawable, layout, menu, mipmap (for icons), and values. Table 1 lists the standard resource folder names. The types are described more fully in Providing Resources. animator XML files that define property animations. anim XML files that define tween animations. color XML files that define "state lists" of colors. (This is different from the colors.xml file in the values folder.) See Color State List Resource. drawable Bitmap files (WebP, PNG, 9-patch, JPG, GIF) and XML files that are compiled into drawables. See Drawable Resources. mipmap Drawable files for different launcher icon densities. See Projects Overview. layout XML files that define UI layouts. See Layout Resource. menu XML files that define app menus such as the options menu. See Menu Resource. raw Arbitrary files saved in raw form. To open these resources with a raw InputStream, call Resources.openRawResource() with the resource ID, which is R.raw.filename. If you need access to original file names and file hierarchy, consider saving resources in the assets folder instead of the raw folder within res. Files in assets are not given a resource ID, so you can read them only using AssetManager. values XML files that contain simple values, such as strings, integers, and colors. For clarity, place unique resource types in different files. For example, here are some filename conventions for resources you can create in this folder: * arrays.xml for resource arrays (typed arrays) * dimens.xml for dimension values * strings.xml, colors.xml, styles.xml See String Resources, Style Resource, and More Resource Types. xml Arbitrary XML files that can be read at runtime by calling Resources.getXml(). Various XML configuration files, such as a searchable configuration, must be saved here, along with preference settings. If no resources are available for the device&apos;s specific configuration, Android uses the default resources that you include in your app—the default drawable elements, which are in the drawable folder, the default text strings, which are in the strings.xml file, and so on. resource_name is the folder name for this type of resource, as shown in Table 1. For example, drawable or values. config_qualifier specifies a device configuration for which these resources are used. All the possible qualifiers are shown in App Resources Overview (Table 2). To add multiple qualifiers to one folder name, separate the qualifiers with a dash. If you use multiple qualifiers for a resource folder, you must list them in the order they are listed in the table. String resources localized to Japanese would be in a strings.xml file inside the values-ja folder in the res folder (abbreviated as res/values-ja/strings.xml). Default string resources (resources to be used when no language-specific resources are found) would be in res/values/strings.xml. 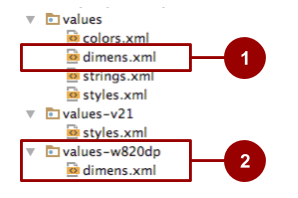 Notice that the XML files have identical names, in this case "strings.xml". In the Project > Project Files pane, the same information is presented differently, as shown in the screenshot below. 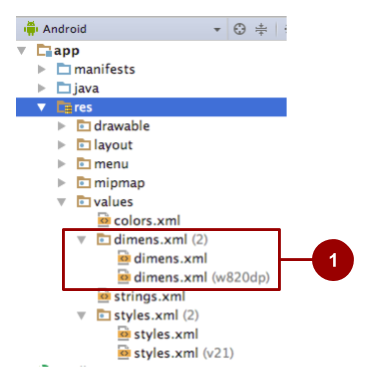 In the Project > Project Files pane in Android Studio, default resources for dimensions are shown in the res/values folder. Alternative resources for dimensions are shown in res/values-qualifier folders. Android supports many configuration qualifiers, and they are described in detail in Providing alternative resources. The table on that page lists the qualifiers in the order you must use when you combine multiple qualifiers in one folder name. For example, res/layout-ldrtl-night/ is a correct folder name, because the table lists the qualifier for layout direction before it lists the qualifier for night mode. A folder with the qualifier names in reverse order (res/layout-night-ldrtl) would be incorrect. 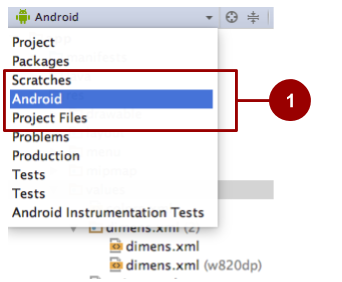 To create alternative resource folders most easily in Android Studio, choose Android in the Project pane (abbreviated as Project > Android pane) as shown by #1 in the figure below. If you don&apos;t see these options, make sure the Project pane is visible by selecting View > Tool Windows > Project. Be sure you are using the Project > Android pane, as shown above. 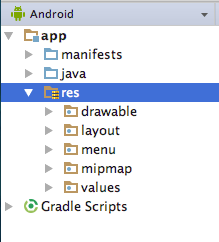 Right-click (or Control-click) on the res folder and select New > Android resource directory. The New Resource Directory dialog appears. Select the type of resource (described in Table 1) and the qualifiers (described in App Resources Overview (Table 2) that apply to this set of alternative resources. In Android Studio, open the XML file (such as activity_main.xml). The layout editor appears. Click the Design tab at the bottom of the layout editor (if it is not already selected). Click the Orientation in Editor button in the top toolbar. Choose an option such as Create Landscape Variation. For a landscape (horizontal) variation, a new editor window opens with the land/activity_main.xml tab showing the layout. You can change this layout, which is specifically for landscape orientation, without changing the original portrait (vertical) orientation. 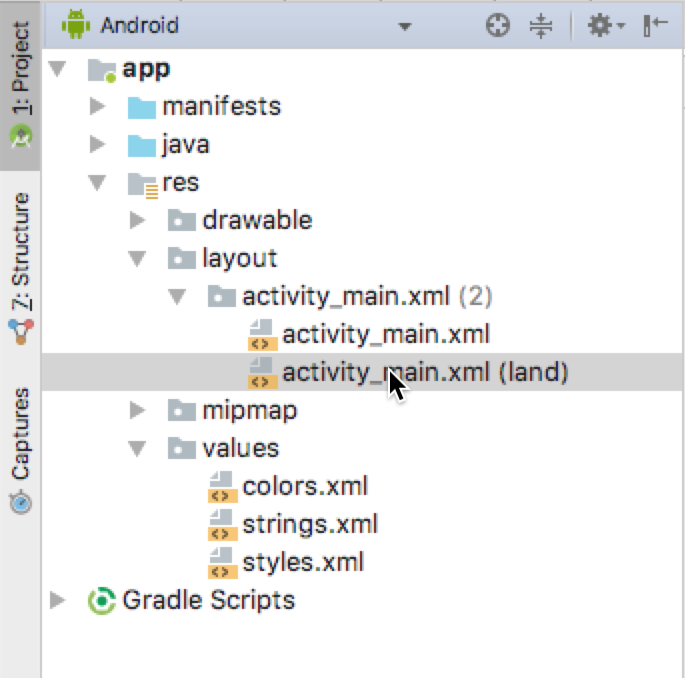 In the Project > Android pane, look inside the res > layout directory, and you will see that Android Studio automatically created the variant for you, called activity_main.xml (land) for the landscape version of activity_main.xml. See the practical about using the layout editor for more details on using the layout editor. 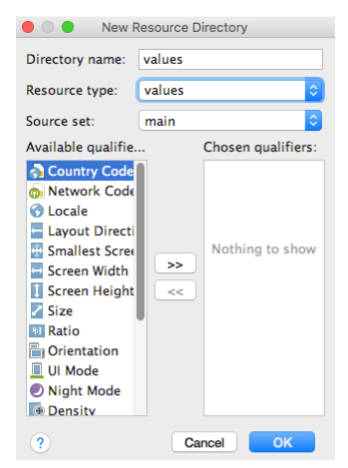 The smallest-width qualifier, specified in the New Resource File dialog for Android Studio as Smallest Screen Width, specifies the minimum width of the device. It is the shortest of the screen&apos;s available height and width, the "smallest possible width" for the screen. The smallest width is a fixed screen-size characteristic of the device, and it does not change when the screen&apos;s orientation changes. where n is the minimum width. For example, resources in a file named res/values-sw320dp/styles.xml are used if the device&apos;s screen is always at least 320dp wide. You can use this qualifier to ensure that a certain layout won&apos;t be used unless it has at least ndp of width available to it, regardless of the screen&apos;s current orientation. If your app provides multiple resource folders with different values for the smallest-width qualifier, the system uses the one closest to (without exceeding) the device&apos;s smallest width. For example, res/values-sw600dp/dimens.xml contains dimensions for images. When the app runs on a device with a smallest width of 600dp or higher (such as a tablet), Android uses the images in this folder. If the user changes the language or region in the device&apos;s system settings while your app is running, and if alternative resources are available, Android automatically reloads your app with alternative resources that match the new device configuration. For information about controlling how your app behaves during a configuration change, see Handle configuration changes. Assume your minSdkVersion is set to 4 and you qualify all your drawable resources using night mode, meaning that you put all your drawable resources in res/drawable-night/ and res/drawable-notnight/. Exclude the notnight qualifier and put your drawable resources in res/drawable/ and res/drawable-night/. To provide the best device compatibility, provide default resources for every resource that your application needs. After your default resources are in place, create alternative resources for specific device configurations using the alternative-resource configuration qualifiers shown in App Resources Overview (Table 2). The related practical is 5.3: Adaptive layouts.